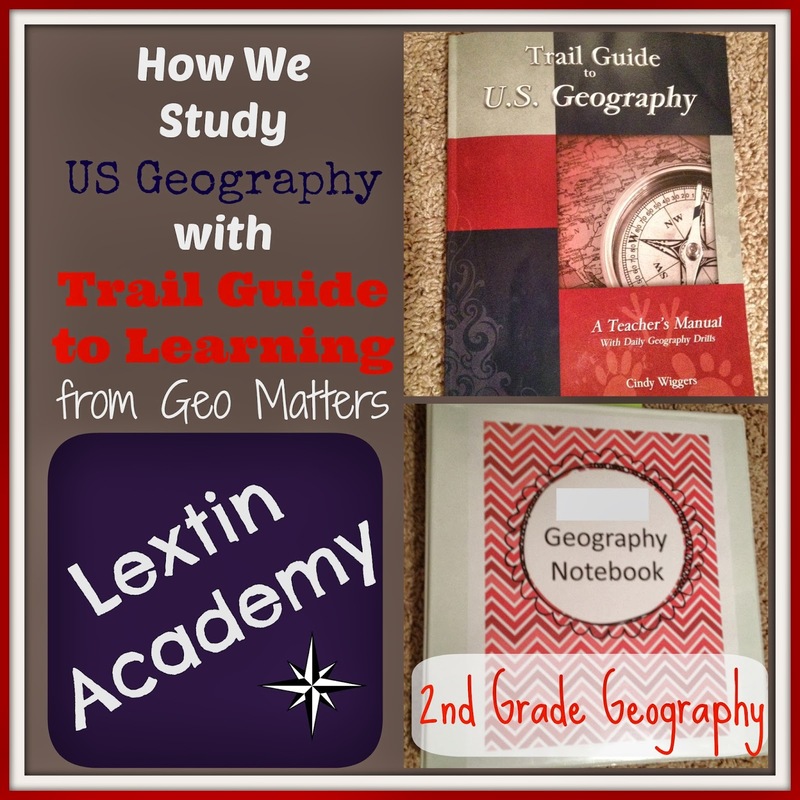 This year we are using the Trail Guide to US Geography from Geo Matters. We are loving it! It is simple, straightforward, and gets done at our house – plus Curly (and I!) are learning so much from it. I have the Teacher’s Manual that gives the questions and mapping assignment for each state. The manual also lists extra projects or research ideas for each state. I bought the Rand McNally Children’s Illustrated Atlas of the US and use that as our main source for maps and facts about the states. I also created a notebook for Curly using the Primary Pages from Trail Guide to Learning. These pages have blank maps, pages to answer the questions, and notebook pages for each state. There are also blank templates to create your own pages. I also printed out a coloring page of the state flag for each state that Curly can complete on her own. The flag pages were found at abcteach. We cover one state per week (as opposed to the two states per week as recommended in the guide). Day 1 – We read the facts about the state in the Atlas and answer the four questions about that state. We also find the state on our large US map and in the regional map in the notebook pages. Curly outlines the state on the regional map. Day 2 – We look at the map of that state and do the mapping assignment. Sometimes we add in extra things to our map – mountains, label other rivers, or add other details. Then Curly outlines the state in green and traces the rivers and any ocean borders in blue. Day 3 – We read over the state facts in the Atlas again and complete the notebook page about the state. I write down the facts that Curly narrates to me and she illustrates the page. Day 4 – We complete the extra notebook page that I have printed for each state. On this page we list the state capital, bird, tree, and nickname. Curly also chooses some of her favorite facts about the state and I write them down for her. She then illustrates 3 of the facts that we included on her page. Day 5 – We review all the previous states learned by looking at them on the map and she practices finding them. We also review all the state capitals we have learned so far. Then Curly completes her flag coloring page. We are really enjoying our geography time because it is very short and simple but Curly retains so much of the information. And she finds the facts about each state so interesting! Sometimes we add a little extra to our studies by researching things that interest us or watching travel videos for the states on the internet. But usually I keep the planning and outside activities to a minimum as we read about the states, complete the maps, and write out facts about each one. We can’t wait to make it through all 50 states!